In Mielar we have formulated and combined bee products with medicinal plant extracts, vitamins and minerals to strengthen and enhance their benefits. And that is how we have achieved an Apicomplet for every situation or for each consumer. Our selection goes from Apicomplets that strengthen the immune system, from those created to take care of your throat, or others that will help young people concentrate better. Super 10 from Mielar is notable for its careful composition as a dietary supplement, suitable for students and people of intense intellectual activity. Super 10 helps increase concentration and memory. Super 10 from Mielar adds to the stimulant properties of royal jelly, the action of phosphorus and taurine and the activity of ginkgo biloba. Super 10 from Mielar contains oak honey, which with its rapidly absorbed carbohydrates, provides energy. The extracts of propolis and rose hips help to overcome temporary fatigue states. The nourishment has to provide the necessary elements for the proper functioning of our body. INGREDIENTS: holm oak honey, purified water, royal jelly, rosehip extract, ginkgo biloba extract, propolis extract, glycerin, magnesium glycerophosphate and L-taurine. 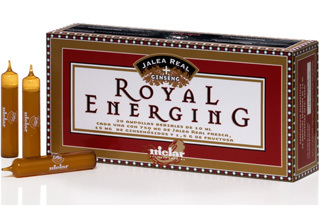 Royal Energing combines the characteristics of royal jelly and ginseng. It is the ideal dietary supplement, an agreeable and potent combination of energy and vitality, which promotes a fuller more intense life. Royal jelly is a complex foodstuff produced in beehives by bees to feed their queen throughout the four to five years of her life. In humans, it acts as a general stimulant on the body and as the ideal food supplement in the daily diet. The best royal jelly comes from new royal cells. A careful process of harvesting and preserving guarantees the quality of Mielar S.A. Royal Jelly, which is of benefit to the consumer, either in pure form or in preparations. Ginseng is a well-known plant traditionally grown in the Asian north-east and whose root is highly valued for its restorative and regulating effect on the nervous system. The ginseng estract used by Mielar S.A. to produce Royal Energing is obtained using a careful process which ensures the main active ingredients are unaltered and whose only function is to increase the concentration. We need the food we eat to supply us with what our body requires to function properly. Its richness in nutrients makes it important to include Royal Energing as one of the foods in our modern diet. INGREDIENTS: Purified water, Fructose, Royal Jelly, Ginseng, Orange aroma. Drinkable ampoules for children 2 to 12 years old. Apicomplet Infantil (Formula for Children) contains royal jelly, orange blossom honey, rose hip and extracts of pollen that strengthen the immune system, promote their development, stimulate their appetite and favor sleep. Apicomplet Formula for Children, made by MIELAR, is the ideal dietary complement for children. The pollen and royal jelly it contains are high in minerals, vitamins and amino acids and come from a natural - not synthetic - source, making it easy for the body to absorb all the nutrients in Apicomplet. Rose-hip fruit is rich in vitamin C and boosts the immune system, making the body more resistant to viruses, and helps bones to assimilate and fix calcium. Orange blossom honey has a pleasant taste and is used to sweeten the product without the need for flavourings and artificial or refined sugars. It also provides an energy source and promotes beneficial sleep. INGREDIENTS: distilled water, orange blossom honey, royal jelly, pollen extract and rose-hip juice. PROP-P from Mielar, is notable for its careful composition as a dietary supplement, suitable for enhancing the body's natural defenses, helping to mitigate and prevent disorders caused by seasonal changes. Royal jelly is a complex food from the hive. With Royal Jelly bees feed their queen during its 4 to 5 years of life. Royal jelly acts in people as a general stimulant of the body and as an ideal food supplement of the daily diet. The best royal jelly is obtained from new queen cells of the honeycomb. The quality of Royal Jelly from Mielar is guaranteed by a careful harvesting and conservation process that will ultimately reverse, pure or in preparations to the consumer. Propolis is a gum collected and elaborated by the bees, which line the hive to protect it. It is harvested from early spring until the onset of the cold weather, by a relatively small number of specialized bees. They obtain the propolis's raw materials, from the buds and young shoots of trees and plants. The propolis composition, include flavonoids that confer its particular properties. Nourishment has to provide the necessary elements for the proper functioning of our body. INGREDIENTS: purified water, fructose, royal jelly and extracts: propolis, echinacea, rosehips, thyme and pine buds. 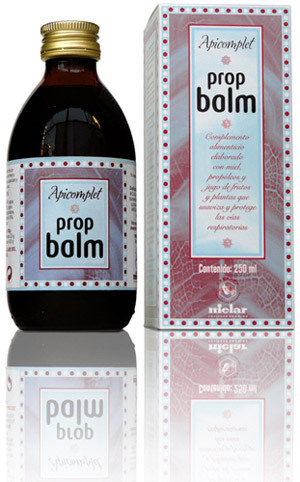 PropBalm is a dietary supplement presented as a balsamic syrup based on thyme honey, cane brown sugar and propolis extracts, echinacea, thyme, peach, pine buds, plantain, and Iceland lichen. In addition to stimulating our natural defenses it acts as a mucolytic, relieves cough and soothes the throat. Recommended Daily Dosage: Adults: 3 to 5 tablespoons (10ml 3-5 times). Children from 3 to 8 years: 3 to 5 teaspoon (3-5 x 5 ml). Apicomplet Prop-Gola is Mielar’s mouth spray for oral and throat hygiene. Mielar’s Prop-Gola helps to keep the mucosa in the throat cavity in an optimal state, reducing the spread of virus and bacteria, eliminating bad breath and providing pleasant and refreshing flavor. Ingredients: Vegetable glycerine, propolis, thyme and purified water.